This low-capital-intensity water monitoring startup looks a lot like an IT firm. Israel-based TaKaDu, a software-as-a-service (SaaS) startup that provides utilities with water infrastructure monitoring, won an undisclosed amount of venture funding led by Emerald Technology Ventures with existing investors Giza Venture Capital and Gemini Israel Funds. The firm's previous round was $3.5 million. There are similarities between the electrical grid and the water grid. Both are crucial components of societal infrastructure that are sprawling, aging and haphazardly planned. And in both cases, although there is some intelligence at the nodes, the systems are not very effectively networked. TaKaDu provides water infrastructure monitoring as a service and acts as the "online eyes and ears" of the network. The firm's software-as-a-service model allows water utilities to reduce water loss and improve operational efficiency with no network changes or capital expenditures. Their system is based on mathematical and statistical algorithms that use readings from existing water metering equipment (flow, pressure, quality, turbidity, etc.). Interestingly, one of the company's investors categorizes TaKaDu as an IT company -- which actually makes sense. The world has a severe water problem, although it is distributed somewhat unevenly. The crisis is already in full effect in Australia and the Middle East, and it's coming to a developed nation near you sometime soon. According to some government estimates, 36 U.S. states will face a water shortage within the next five years. Drought and global warming are the macro threats. But on a micro level, the water networks themselves are part of the problem. The World Bank estimates global water loss at 25 percent to 30 percent, representing a $20 billion issue. Essentially, we're talking about aging, leaky pipes and valves. As an example, fifty percent of the water infrastructure in London is more than one hundred years old, according to TaKaDu. The U.S. loses six billion gallons of water a day according to the EPA, and averages hundreds of bursts per thousand miles of pipeline per year according to the American Water Works Association (AWWA). A typical water utility has almost no visibility into its own network. 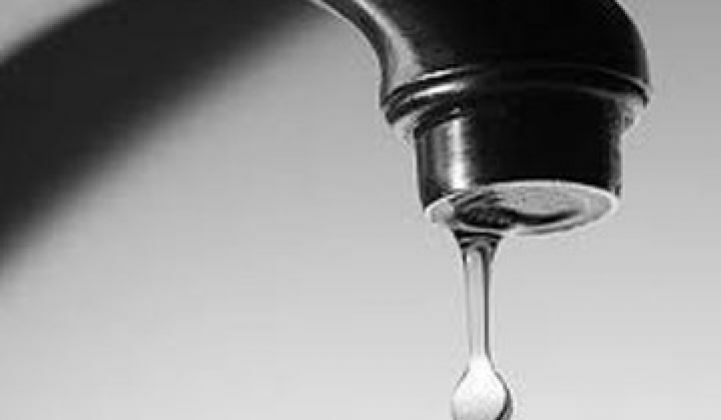 Water companies typically learn of a leak when the event is reported by a customer. What's more, water meters tend to be unreliable. The punchline is that TaKaDu can take sparse and spiky data from existing sensors and fold that in with weather data, acoustic data, and GIS data to enable the smart water grid. The water utility can then improve its ability to plan and forecast, saving money and resources in the process. TaKaDu's water network management can prevent, weeks or months ahead of time, significant events in real-world networks by alerting utilities to the small changes that precede bursts and other anomalies. TaKaDu is operational, with utilities and partners in Europe, Australia, Latin America, Israel and the U.S. The startup sells through partners in the hydrocosm like IBM and Schneider Electric rather than selling directly to water companies. The cost of the software can range from $10,000 to $150,000 per month depending on the size of the pipeline system.